The Our Food Our Health Our Culture project is facilitated by Food Matters Manitoba and works in three project sites: North End Winnipeg, Fox Lake Cree Nation/Gillam (northern Manitoba), and La Ronge/Lac La Ronge Indian Band/Air Ronge (northern Saskatchewan). These programs address healthy eating holistically by equipping individuals and families with the skills they need for healthy eating at home, but also creating environments – schools, communities, agencies, and retailers – that value and support healthy and/or traditional foods. 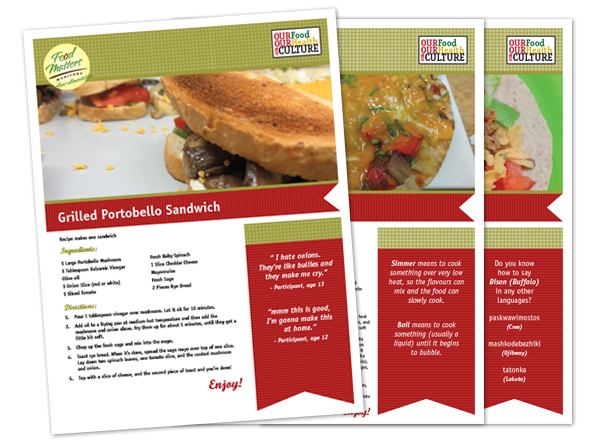 The recipe pages created here are from cooking classes that took place in all three project sites.